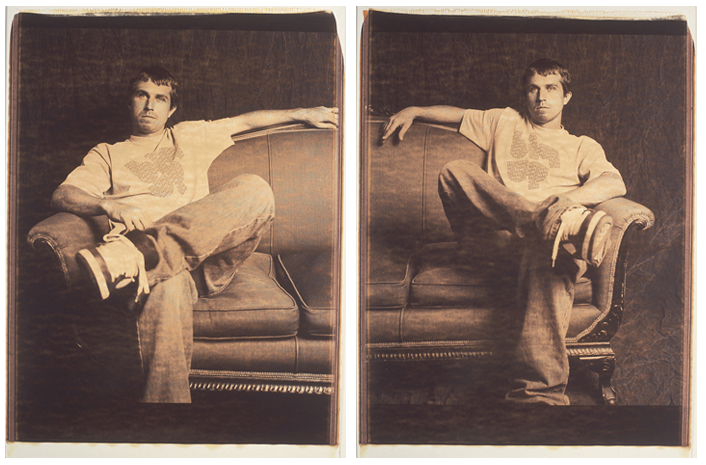 The 20X24 Polaroid Project I did in 2003 stemmed from an earlier workshop I did in 2001 with Tracy Storer at the Santa Fe Photographic Workshops in New Mexico. The story starts earlier than that however, it starts with a show at MOPA in San Diego that I saw way back in the early 80s featuring various artists and photographers and their work with the massive 20X24 Polaroid camera. There were only I think six of these cameras in the world at this time and to a photographer and especially to a student as myself this camera was like the Holy Grail. In a room off of the main gallery room I could see some people working with the dishwasher sized camera and setting up a shot, I was intrigued and envious of them for being able to create with that behemoth device. I vowed that I would someday work with that beautiful box. Like I said, the camera is the size of a dishwasher and sits on top of a wheeled trolley and consists of a lens, lens board, a bellows and a ground glass for focusing, it is a large view camera, we're talking BIG! Once you focus the subject, you swing the film back onto the rear of the camera, the film back houses two rolls of Polaroid film, one roll is positive and the other is negative. A chemical pod that looks similar to an Otter Pop is also inserted at the bottom. From this point, it's pretty much like shooting any camera or Polaroid, except BIGGER! You set your lens and click the shutter and pull the film out the bottom where the pod of chemicals squeezes onto the paper and cut the paper to the proper length. There is a wait to allow the image to develop and then you peel the negative and the positive apart like you would with a regular Polaroid except it is Bigger. The first time you do this, it is a total mindblower! Shooting smaller Polaroids after that pale in comparison to the 20X24 format. I have told a pretty abridged and simplified and novice version of this process, sorry to Tracy Storer and John Reuter. So, back to this project I was working on in 2003. 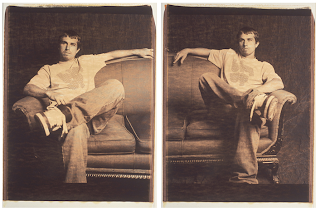 I was collaborating with Josh W Higgins on my AIGA photo exhibition in San Diego and my friend, Mike Farber offered to be my patron and fund a trip to San Francisco and work with the 20X24 Polaroid that Tracy Storer operated there. I started contacting some SF professional skaters that I knew weeks in advance and gave them a date for shooting and they all showed up during the day and we made some great photos. I also made some Polaroid transfers the day before with some of my art photography, but that's another story. My 20 year long dream of working with that giant camera came true on those trips to Santa Fe and San Francisco, I consider myself very fortunate. Thanks to the skaters, Tracy Storer, Mike Farber and Josh Higgins for the opportunity. Check out the link to see the photos. Check out the link to see the Polaroids.